Some time prior to World War II the Germans not only started to make weapons which were forbidden by the Versailles Treaty but they also devised a system of code numbers which were assigned to the firms who were supplying material for the Government. Manufacturers names were not used. At the close of World War I the Germans were allowed to have a „Police Army" of 100,000 men, and to equip this force Simson & Co. of Suhl were given the task of assembling Lugers from material left over at the end of the war. 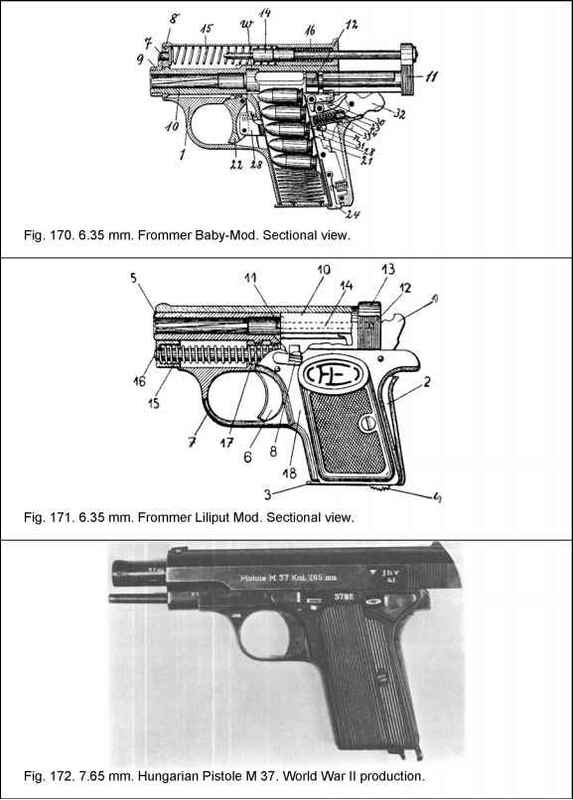 As this firm happened to be the 42nd on the list of Government suppliers it was assigned the code number 42, and this was used until this firm ceased its independent existence in the early or middle 1930s and was succeeded by Mauser who had taken over the manufacture of the Luger from D.W.M. Antisemitic feeling was running high in Germany at this time and Simson was forced out. The firm, now under Aryan control, continued to operate for some time, perhaps into 1937. As Mauser had acquired a large number of parts, along with machinery, the pistols produced by them continued to bear the D.W.M. markings for some time. When the parts had been used up, these markings were discontinued and the code number 42, formerly used by Simson & Co., was used along with the marking S/42 (see Plate 28). Both markings were used until 1941 when the Germans adopted a new code system which consisted of combinations of either two or three letters. The code designation assigned to Mauser was byf, and this was used on all pistols made by this firm during the remainder of the War. Letter codes were also assigned to firms in the occupied countries and in some cases to firms in other countries who were supplying military equipment to the Germans. CHARLES C THOMAS • PUBLISHER Springfield • Illinois • U.S.A.